Sergey Mikhaylovich Prokudin-Gorsky (Russian: Серге́й Миха́йлович Проку́дин-Го́рский, listen (help·info); August 30 [O.S. August 18] 1863 – September 27, 1944) was a Russian chemist and photographer. 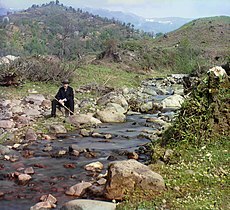 He is best known for his pioneering work in colour photography and his effort to document early 20th-century Russia. 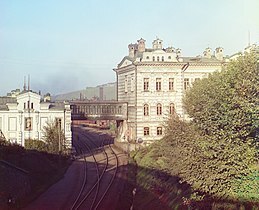 Using a railroad-car darkroom provided by Tsar Nicholas II, Prokudin-Gorsky traveled the Russian Empire from around 1909 to 1915 using his three-image colour photography to record its many aspects. While some of his negatives were lost, the majority ended up in the U.S. Library of Congress after his death. 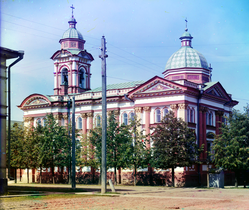 Starting in 2000, the negatives were digitised and the colour triples for each subject digitally combined to produce hundreds of high-quality colour images of century-ago Russia. 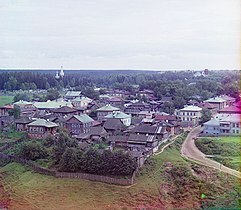 Prokudin-Gorsky was born in Murom in the ancestral estate of Funikova Gora, in what is now Kirzhachsky District, Vladimir Oblast. His parents were of the Russian nobility, and the family had a long military history. They moved to Saint Petersburg, where Prokudin-Gorsky enrolled in Saint Petersburg State Institute of Technology to study chemistry under Dmitri Mendeleev. He also studied music and painting at the Imperial Academy of Arts. In 1890, Prokudin-Gorsky married Anna Aleksandrovna Lavrova, and later the couple had two sons, Mikhail and Dmitri, and a daughter, Ekaterina. Anna was the daughter of the Russian industrialist Aleksandr Stepanovich Lavrov, an active member in the Imperial Russian Technical Society (IRTS). 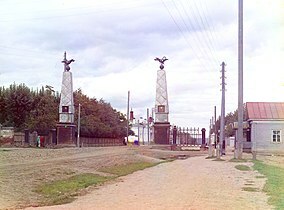 Prokudin-Gorsky subsequently became the director of the executive board of Lavrov's metal works near Saint Petersburg and remained so until the October Revolution. He also joined Russia's oldest photographic society, the photography section of the IRTS, presenting papers and lecturing on the science of photography. In 1901, he established a photography studio and laboratory in Saint Petersburg. In 1902, he traveled to Berlin and spent six weeks studying colour sensitization and three-colour photography with photochemistry professor Adolf Miethe, the most advanced practitioner in Germany at that time. 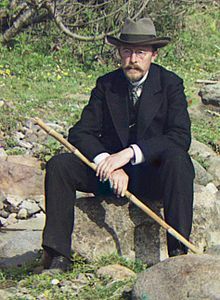 Throughout the years, Prokudin-Gorsky's photographic work, publications and slide shows to other scientists and photographers in Russia, Germany and France earned him praise, and in 1906 he was elected the president of the IRTS photography section and editor of Russia's main photography journal, the Fotograf-Liubitel. 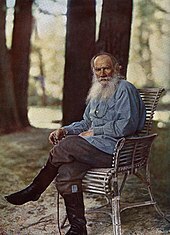 Gorsky was a member of the Royal Photographic Society between 1920 and 1932..
Perhaps Prokudin-Gorsky's best-known work during his lifetime was his color portrait of Leo Tolstoy, which was reproduced in various publications, on postcards, and as larger prints for framing. 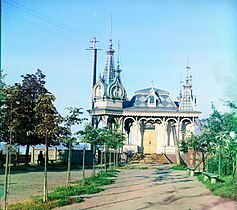 The fame from this photo and his earlier photos of Russia's nature and monuments earned him invitations to show his work to the Russian Grand Duke Michael Alexandrovich and Dowager Empress Maria Feodorovna in 1908, and to Tsar Nicholas II and his family in 1909. The Tsar enjoyed the demonstration, and, with his blessing, Prokudin-Gorsky got the permission and funding to document Russia in color. In the course of ten years, he was to make a collection of 10,000 photos. Prokudin-Gorsky considered the project his life's work and continued his photographic journeys through Russia until after the October Revolution. He was appointed to a new professorship under the new regime, but he left the country in August 1918. He still pursued scientific work in color photography, published papers in English photography journals and, together with his colleague S. O. Maksimovich, obtained patents in Germany, England, France and Italy. In 1920, Prokudin-Gorsky remarried and had a daughter with his assistant Maria Fedorovna née Schedrimo. The family finally settled in Paris in 1922, reuniting with his first wife and children. Prokudin-Gorsky set up a photo studio there together with his three adult children, naming it after his fourth child, Elka. In the 1930s, the elderly Prokudin-Gorsky continued with lectures showing his photographs of Russia to young Russians in France, but stopped commercial work and left the studio to his children, who named it Gorsky Frères. He died in Paris on September 27, 1944, a month after the Liberation of Paris. He is buried in the Sainte-Geneviève-des-Bois Russian Cemetery. 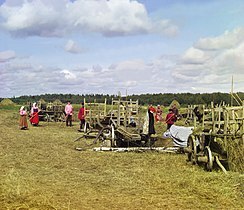 The method of color photography used by Prokudin-Gorsky was first suggested by James Clerk Maxwell in 1855 and demonstrated in 1861, but good results were not possible with the photographic materials available at that time. In imitation of the way a normal human eye senses color, the visible spectrum of colors was divided into three channels of information by capturing it in the form of three black-and-white photographs, one taken through a red filter, one through a green filter, and one through a blue filter. The resulting three photographs could be projected through filters of the same colors and exactly superimposed on a screen, synthesizing the original range of color additively; or viewed as an additive color image by one person at a time through an optical device known generically as a chromoscope or photochromoscope, which contained colored filters and transparent reflectors that visually combined the three into one full-color image; or used to make photographic or mechanical prints in the complementary colors cyan, magenta and yellow, which, when superimposed, reconstituted the color subtractively. The first person to widely demonstrate good results by this method was Frederic E. Ives, whose "Kromskop" system of viewers, projectors and camera equipment was commercially available from 1897 until about 1907. Only the viewers and ready-made triple photographs for use in them sold in any significant quantity. Still life arrangements, unpopulated landscapes and oil paintings were the typical subject matter, but a few examples of color portraiture from life were also offered. Several Kromskop color views of the aftermath of the 1906 San Francisco earthquake and fire, apparently never issued commercially, have recently come to light. Another very notable practitioner was Adolf Miethe, with whom Prokudin-Gorsky studied in Germany in 1902. Miethe was a photochemist who greatly improved the panchromatic characteristics of the black-and-white photographic materials suitable for use with this method of color photography. He presented projected color photographs to the German Imperial Family in 1902 and was exhibiting them to the general public in 1903, when they also began to appear in periodicals and books. Miethe took the first known aerial color photographs, from a hot air balloon, in 1906. In England in 1899 Ives's former assistant, Edward Sanger-Shepherd, commercialized the application of the three-colour process in the "Sanger Shepherd process of natural colour photography". With his process in 1903 and 1904 Sarah Angelina Acland produced the first substantial body of work in colour photography by an amateur photographer. By 1905 seventeen different photographers had shown three-colour slides by the Sanger-Shepherd process at exhibitions of the Royal Photographic Society in England. Photographic plates, which had the light-sensitive emulsion coated on a thin sheet of glass, were normally used instead of flexible film, both because a general transition from glass plates to plastic film was still in progress and because glass provided the best dimensional stability for three images intended to match up perfectly when they were later combined. An ordinary camera could be used to take the three pictures, by reloading it and changing filters between exposures, but pioneering color photographers usually built or bought special cameras that made the procedure less awkward and time-consuming. One of the two main types used beam splitters to produce three separate images in the camera, making all three exposures at the same time and from the same viewpoint. Although a camera of this type was ideal in theory, such cameras were optically complicated and delicate, and liable to get out of adjustment. Some designs were also subject to optical phenomena that could cause noticeably uneven color or other defects in the results. The other, more robust type was an essentially ordinary camera with a special sliding holder for the plates and filters that allowed each in turn to be efficiently shifted into position for exposure—an operation sometimes partly or even entirely automated with a pneumatic mechanism or spring-powered motor. When the three color-filtered photographs were not taken at the same time, anything in the scene that did not hold steady during the entire operation would exhibit colored "fringes" around its edges in the resulting color image. If it moved continuously across the scene, three separate strongly-colored "ghost" images could result. 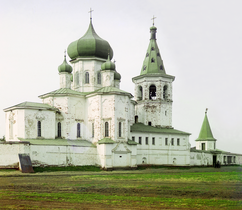 Such color artifacts are plainly visible in ordinary color composites of many of Prokudin-Gorsky's photographs, but special digital image processing software was used to artificially remove them, whenever possible, from the composites of all 1,902 of the images commissioned by the Library of Congress in 2004. The altered versions have proliferated online and older or third-party versions showing these tell-tale peculiarities are increasingly scarce. Adolf Miethe designed a high-quality, sequential-exposure color camera, which was manufactured by Bermpohl and became available commercially in 1903. 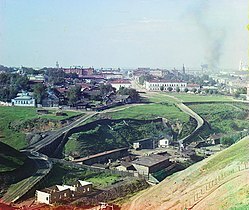 Prokudin-Gorsky published an illustration of it in Fotograf-Liubitel in 1906. The most common model used a single oblong plate 9 cm wide by 24 cm high, the same format as Prokudin-Gorsky's surviving negatives, and it photographed the images in unconventional blue-green-red sequence, which is also a characteristic of Prokudin-Gorsky's negatives if the usual upside-down image in a camera and gravity-compliant downward shiftings of his plates are assumed. An inventor as well as a photographer, Prokudin-Gorsky patented an optical system for cameras of the simultaneous-exposure type, and it is often claimed or implied that he invented, or at least built, the camera used for his Russian Empire project. No definite written or photographic documentation of his field equipment is known to exist, only the evidence inherent in the photographs themselves, and no rationale has been suggested for going to the trouble and expense of building a functionally identical copy of a Miethe-Bermpohl camera instead of simply buying one. Miethe and Bermpohl also produced a matching three-color projector and a chromoscope. The Goerz optical company made a differently configured and more powerful three-color projector for Miethe. It, too, was commercially available. The required exposure time depended on the lighting conditions, the sensitivity of the photographic plate, and the camera lens aperture used. In a letter to Leo Tolstoy requesting a portrait sitting, Prokudin-Gorsky described the exposure as taking one to three seconds, but later, when recollecting his time with Tolstoy, he described a six-second exposure on a sunny day. Blaise Agüera y Arcas studied one landscape view, photographed in broad daylight but showing a clear, well-defined moon, and used the moon's movement to estimate that the whole procedure of three filtered exposures and two repositionings of the camera's plate holder had taken over a minute. The lens aperture Prokudin-Gorsky chose to use greatly affected the exposure time required. A small aperture is often used for landscape photography because it allows objects at various distances to all be sharply imaged at the same time, while the use of a large aperture is common for portraiture and plainly evident in the Tolstoy portrait. All other factors being equal, if for example a 16-second exposure was required when using a 1/4-inch-diameter aperture, an exposure of only 1 second would suffice with a 1-inch aperture. 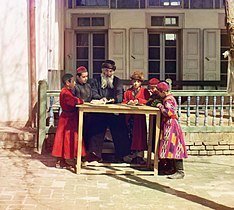 Prokudin-Gorsky was also acquainted with the use of Autochrome color plates, which did not require a special camera or projector. He was one of the favored few the Lumière Brothers introduced to their new product in 1906, the year before it went into commercial production. Autochrome plates were expensive and not sensitive enough for casual "snapshots" with a hand-held camera, but their use was simple and in expert hands they were capable of producing excellent results. 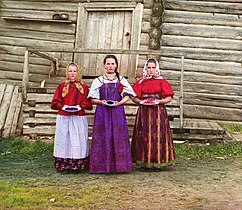 They made color photography truly practical for advanced amateurs and led some pioneering users of color separation cameras to abandon their methods as outmoded, but Prokudin-Gorsky was not won over. 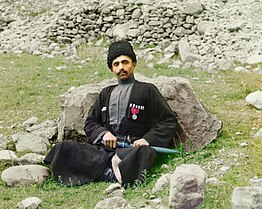 No Autochromes by Prokudin-Gorsky are known to survive. Although photographic color prints of the images were difficult to make at the time and slide show lectures consumed much of the time Prokudin-Gorsky used to demonstrate his work, photomechanical color prints of some were published in journals and books, and his studio issued some, most notably the Tolstoy portrait, as postcards and large photogravures. Many of the original prints published by his studio still survive. Prokudin-Gorsky's own inventions, some of them collaborative, led to the granting of numerous patents, most issued during the years of his voluntary exile and not directly related to the body of work on which his fame now rests. Some concern processes for making subtractive color transparencies, which do not require any special projection or viewing equipment. Examples of these were preserved by Prokudin-Gorsky's family and have recently appeared online. Most of his patents relate to the production of natural-color motion pictures, a potentially lucrative application that attracted the attention of many inventors in the field of color photography during the 1910s and 1920s. 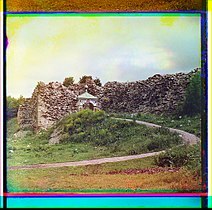 Around 1905, Prokudin-Gorsky envisioned and formulated a plan to use the emerging technological advances that had been made in color photography to document the Russian Empire systematically. Through such an ambitious project, his ultimate goal was to educate the schoolchildren of Russia with his "optical color projections" of the vast and diverse history, culture, and modernization of the empire. 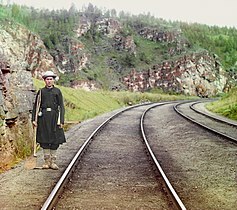 Outfitted with a specially equipped railroad-car darkroom provided by Tsar Nicholas II and in possession of two permits that granted him access to restricted areas and cooperation from the empire's bureaucracy, Prokudin-Gorsky documented the Russian Empire around 1909 through 1915. He conducted many illustrated lectures of his work. His photographs offer a vivid portrait of a lost world—the Russian Empire on the eve of World War I and the coming Russian Revolution. His subjects ranged from the medieval churches and monasteries of old Russia, to the railroads and factories of an emerging industrial power, to the daily life and work of Russia's diverse population. It has been estimated from Prokudin-Gorsky's personal inventory that before leaving Russia, he had about 3500 negatives. Upon leaving the country and exporting all his photographic material, about half of the photos were confiscated by Russian authorities for containing material they deemed strategically sensitive for war-time Russia. According to Prokudin-Gorsky's notes, the photos left behind were not of interest to the general public. Some of Prokudin-Gorsky's negatives were given away, and some he hid on his departure. Outside the Library of Congress collection, none has yet been found. By the time of Prokudin-Gorsky's death, the tsar and his family had long since been executed during the Russian Revolution, and Communist rule had been established over what was once the Russian Empire. The surviving boxes of photo albums and fragile glass plates the negatives were recorded on were finally stored in the basement of a Parisian apartment building, and the family was worried about them getting damaged. The United States Library of Congress purchased the material from Prokudin-Gorsky's heirs in 1948 for $3500–$5000 on the initiative of a researcher inquiring into their whereabouts. The library counted 1,902 negatives and 710 album prints without corresponding negatives in the collection. 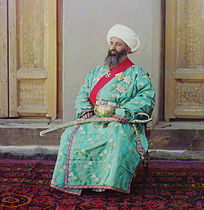 Simple, unretouched color composite of Alim Khan, emir of Bukhara, 1911. At right, the original triple negative on glass, shown here in positive form. 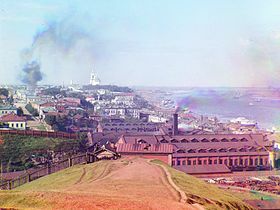 Prokudin-Gorsky photographed the upper, middle and lower images through blue, green and red filters. Due to the very specialized and labor-intensive processes required to make photographic color prints from the negatives, only about a hundred of the images were used in exhibits, books and scholarly articles during the half-century after the Library of Congress acquired them. Their widest exposure was in the 1980 coffee table book Photographs for the Tsar: The Pioneering Color Photography of Sergei Mikhailovich Prokudin-Gorskii Commissioned by Tsar Nicholas II, in which the color images are combined yellow, magenta and cyan ink-on-paper halftones mass-produced with a multicolor printing press in the usual way. It was only with the advent of digital image processing that multiple images could be quickly and easily combined into one. 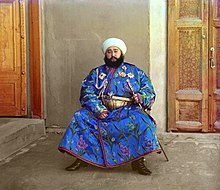 The Library of Congress undertook a project in 2000 to make digital scans of all the photographic material received from Prokudin-Gorsky's heirs and contracted with the photographer Walter Frankhauser to combine the monochrome negatives into color images. He created 122 color renderings using a method he called digichromatography and commented that each image took him around six to seven hours to align, clean and color-correct. 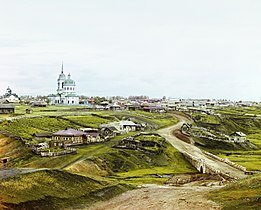 In 2001, the Library of Congress produced an exhibition from these, The Empire That Was Russia: The Prokudin-Gorskii Photographic Record Recreated. 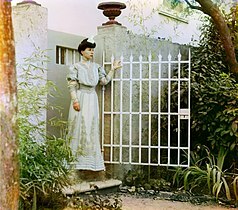 The photographs have since been the subject of many other exhibitions in the area where Prokudin-Gorsky took his photos. In 2004, the Library of Congress contracted with computer scientist Blaise Agüera y Arcas to produce an automated color composite of each of the 1,902 negatives from the high-resolution digital images of the glass-plate negatives. He applied algorithms to compensate for the differences between the exposures and prepared color composites of all the negatives in the collection. As the library offers the high-resolution images of the negatives freely on the Internet, many others have since created their own color representations of the photos, and they have become a favorite testbed for computer scientists. On 30 August 2018, to commemorate what would have been his 155th birthday, Google released a Google Doodle celebrating him. 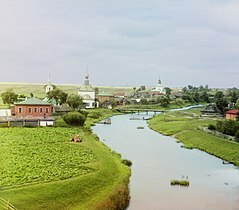 Kama river near Perm, 1910. 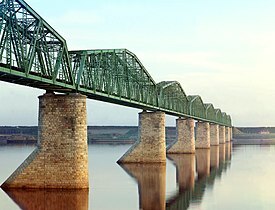 The bridge still stands today, but another similar bridge has been built alongside it. Both are painted white and red. Albert Kahn, a patron of photography who funded photographers to travel around the world recording color images and cine film of diverse ethnic societies between 1909 and 1931. Ansel Adams, American black and white photographer who was commissioned by a number of organizations to document the American West. ^ Photographer to the Tsar: Sergei Mikhailovich Prokudin-Gorskii. Library of Congress. Retrieved 13 August 2006. ^ Tatarnikova, Annette (2006-06-16). "Tsarskiy fotograf" (in Russian). ^ a b c d e f g Garanina, Svetlana (2003). "Sergei Mikhailovich Prokudin-Gorsky Biography" (PDF). ^ a b c d e f g Adamson, Jeremy; Zinkham, Helena (2002). 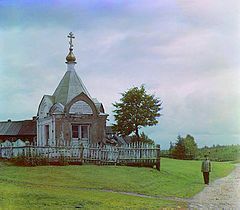 "The Prokudin-Gorskii Legacy: Colour Photographs of the Russian Empire, 1905-1915". Comma. International Council on Archives. 3–4 (Archives and Archival Issues of Russia): 107–143. ISBN 3-598-01357-4. Archived from the original (PDF) on 2009-06-24. 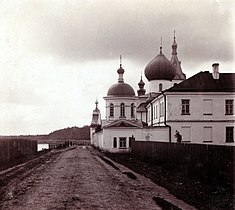 ^ a b c The chronology at Prokudin-Gorsky.org (accessed 26 September 2012) reports six weeks of study with Miethe in 1902. Other accounts give the year as 1889, but a primary source for that extremely early date is not apparent and it does not accord with the circa 1889 biographical details of either man. The major English-language source reporting 1889 (Adamson and Zinkham, p. 108) describes Miethe as "A brilliant young professor at the Charlottenburg Technische Hochschule..." and states (footnote, same page) that "While in Berlin, Prokudin-Gorskii is said to have given technical courses in photochemistry and spectrum analysis at the Technische Hochschule...", which evidences confusion of the facts somewhere along the line: biographies of Miethe all agree that he, not Prokudin-Gorsky, was the professor of photochemistry and spectroanalysis at the Königlich Technischen Hochschule (Royal Technical University) in Berlin, a post he accepted by invitation in 1899 after the sudden death (17 December 1898) of its previous longtime occupant, Hermann Wilhelm Vogel, the discoverer of dye sensitization and himself a colour photography experimenter. It was apparently Miethe's first teaching position and the beginning of his involvement with colour photography. Until then he had been employed by optical firms such as Voigtländer but was already a notable author, journal editor and inventor in the field of (black-and-white) photography. ^ Kington, Miles (2001-09-25). "What's the Russian for: Say Cheese?". London: The Independent. 2001-09-25. Retrieved 2010-05-23. ^ a b "Prokudin-Gorsky's Color Photographs of Tolstoy: in Tolstoy Studies Journal". University of Toronto. Archived from the original on 2013-12-10. ^ Dikovitskaya, Margaret. 2007. 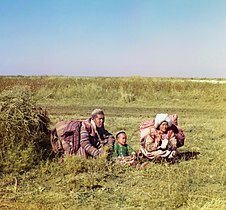 "Central Asia in Early Photographs: Russian Colonial Attitudes and Visual Culture" (PDF). Slavic Eurasian Studies, no. 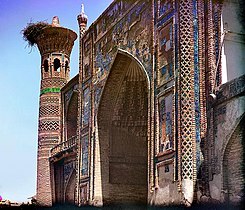 14: Empire, Islam, and Politics in Central Eurasia. Sapporo: Slavic Research Center. ^ "Interview with Orlando Figes, presenter of a BBC documentary about Gorsky". BBC Four. ^ a b Coe, Brian, Colour Photography: The First Hundred Years 1840-1940, Ash & Grant, 1978. Also published in the U.S., this excellent and amply-illustrated overview of the history of color photography before Kodachrome nevertheless, like other books on the subject, includes a few wrong dates and repeats entrenched but demonstrably erroneous conventional wisdom about the color sensitivity of pre-1906 photographic materials. ^ a b c Blaise Agüera y Arcas (September 28, 2004). "Reconstructing Prokudin-Gorskii's Color Photography in Software". Library of Congress. Archived from the original on 2012-03-22. Regarding exposure times, although the author states (Figure 1) that "each exposure" in the example appears to have taken "upward of 20 seconds", it is plain from the animated pair of images that, as is more clearly expressed at the start of the same sentence, most of the moon's motion occurred between the exposures; the actual exposures account for only a minor fraction of that time. Various causes for an unusual delay or atypically slow operation of the camera's plate-shifting mechanism may be imagined. The moon is effectively invisible in the blue-filtered exposure, in which the sky appears as if white, so the author must necessarily be extrapolating a total time based on the other two exposures. ^ Simple "warts and all" color composites of all the Library of Congress plates are available at Prokudin-Gorsky.org (accessed 26 September 2012), often accompanied by cleaned-up versions with only overall adjustments to color balance and contrast and manual retouching to remove spots or repair damage, traditional procedures not usually regarded as crossing over the line into historical revisionism. ^ Professor Dr. Miethe's Dreifarben-Camera (retrieved 12 October 2012) features several photographs of the 9 x 24 cm model and a more detailed description of its operation, along with an abundance of related information. The Miethe-Bermpohl Dreifarbenkamera ("three-color camera") should not be confused with the much later Bermpohl Naturfarbenkamera ("natural color camera"), a very different "one-shot" type that simultaneously exposed three separate plates and was manufactured from 1929 until circa 1950. ^ British patent 185,161, issued in 1922, and U.S. patent 1,456,427, issued in 1923. ^ Wagner, Jens (2006). "Die additive Dreifarbenfotografie nach Adolf Miethe" Archived 2014-03-28 at the Wayback Machine. Text in German only. The Bermpohl chromoscope and projector are shown in contemporary line engravings on pages 22 and 23 of the first section of this scholarly thesis. A Miethe-Bermpohl camera and a Miethe-Goerz projector are shown in detailed photographs on pages 1 through 7 of the color illustration section. 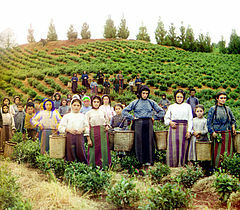 Examples of Miethe's color photographs, some possibly as early as 1902, can be found in the same section. 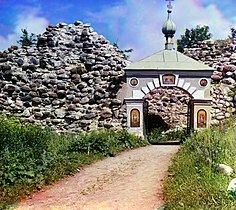 ^ Prokudin-Gorsky.org chronology. Retrieved 26 September 2012. 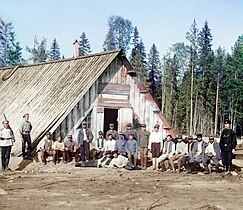 "October 13, 1906: At a meeting of the 5th section of the Imperial Russian Technological Society, Prokudin-Gorsky reports on his trip to the Lumière Brothers in Lyons, manufacturers of photographic plates, and demonstrates slides he had made using the Autochrome method". ^ Prokudin-Gorsky.org forum page 10 (retrieved 26 September 2012, text in Russian only) shows twenty different examples. All are apparently glass-bound lantern slides, with at least one in the 3.25-inch-square British standard format. Some were made from negatives now in the Library of Congress, some from lost negatives previously known only from the albums of small black-and-white prints Prokudin-Gorsky routinely made from one of the three elements. Some are still life arrangements of unknown provenance, possibly from the 1920s, and two are circa 1935 portraits of his children. He appears to have used at least two different processes. In one category of specimens, all except the cyan layer has badly faded, typically contracting and splitting as well. This indicates both the use of unstable dyes and an assemblage of layers somewhat like that in the circa 1900 Sanger-Shepherd process, in which a stable cyan-toned image in an emulsion on glass was laminated with magenta and yellow dye images on very thin sheets of chemically unstable celluloid. The splitting is evocative of an earlier Lumière process that incorporated alternating layers of dissimilar materials. Another category of specimens shows neither drastic differential fading nor splitting. One slide in this latter category bears a labelthat explicitly credits a Prokudin-Gorsky process. The basic principle involved had been patented by Louis Ducos du Hauron in 1868. Other inventors later patented an array of specific implementations, variations and improvements, but though it sometimes produced excellent results, this kind of process was just too expensively labor-intensive to be practical for the commercial production of color slides. ^ a b "The Prokudin-Gorskii Photographic Record Recreated: The Empire That Was Russia - Ethnic Diversity". Library of Congress. Retrieved 10 May 2013. ^ "The Prokudin-Gorskii Photographic Record Recreated: The Empire That Was Russia - Exhibition Home". Library of Congress. Retrieved 10 May 2013. ^ a b c d Minachin, Victor (2003). "The Splendors of Russia Collection" in the Library of Congress. "Restavrator-M" Restoration Center. ^ Muir, Robin (2001-06-24). "By appointment to the tsar". The Independent on Sunday. pp. 24–25. Tantalisingly, he hid a dozen or so color plates of the Romanovs but never disclosed where (most likely in St Petersburg) They may yet surface. ^ Robb, Andrew. May 2001. "Albums, Photos, Glass Plate Negatives." Conservation Corner - Library of Congress Information Bulletin, May 2001 - Vol 60, No. 5. ^ Allshouse, Robert H., ed. (1980). Photographs for the Tsar: The Pioneering Color Photography of Sergei Mikhailovich Prokudin-Gorskii Commissioned by Tsar Nicholas II. London: Sidgwick & Jackson. ISBN 0-283-98678-6. ^ Goldsmith, Arthur (1980). In Photographs for the Tsar. London: Sidgwick & Jackson. ^ Austen, Ian. (2001-06-14). "Colors of a Lost Empire Are Reborn, Digitally." The New York Times. ^ "All Exhibitions - Exhibitions (Library of Congress)". www.loc.gov. 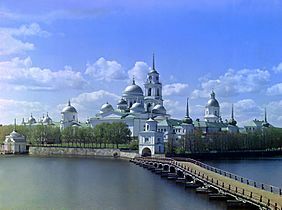 ^ Library of Congress Exhibition of Russian Photographs Opens in St. Petersburg on April 12, 2003. Library of Congress. ^ Osipov, Georgy (2003). ""Miracles of the Tsar's Photographer"". Archived from the original on November 12, 2003. Retrieved 2009-03-26. CS1 maint: BOT: original-url status unknown (link). The New Times. ^ "Sergei Mikhailovich Prokudin-Gorsky. 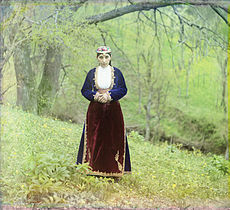 A Selection from the Collection 'The Splendors of Russia in Natural Color'—Color Photographs from the Years 1905–1916'" Šechtl & Voseček Museum of Photography, 2006. ^ "Exhibition of Sergei Prokudin-Gorskii’s at TBC Bank Places History in Full Color Archived 2009-08-18 at the Wayback Machine." U.S. Embassy Georgia, January 18, 2007. ^ Girvan, Ray (2005). "The color of the past." Scientific Computing World, July/August 2005. ^ "Sergey Prokudin-Gorsky's 155th Birthday". Google. 30 August 2018. ^ "Tipy Dagestana". Library of Congress. Retrieved 10 May 2013. Wikimedia Commons has media related to Sergei Mikhailovich Prokudin-Gorskii.